Once POT is hot add in the Cumin/Jeera,Black Pepper and Cashewnuts.Saute for 30 secs or till cashew nuts turn light brown in color. Add the chopped green chillies, ginger ,curry leaves and asafoetida.Saute for another 30 secs. Next, add the washed dal and rice. Saute well 1-2 minutes till dal turns light brown or till aromatic. 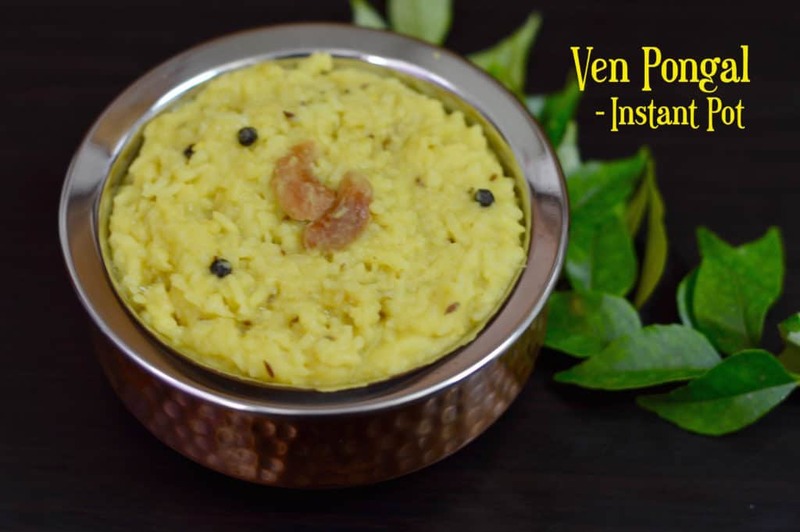 Once the pressure has released, open the lid and mix pongal well.Note: If rice is not mushy then select saute mode and add 1 cup of water and cook for 1-2 minutes or till mixture boils. 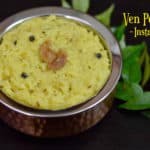 Pongal is ready, serve with yogurt,raita or tamarind chutney. Heat 1 teaspoon ghee in a pressure cooker and add the washed dal and rice,Saute well 1-2 minutes till dal turns light brown or till aromatic. Add 4 cups of water ,mix well. Once the pressure has released, open the lid and Mix the mixture well. Meanwhile in a pan add remaining ghee ,once its hot add Cumin/Jeera,Black Pepper,asafoetida. Then add the chopped green chillies, ginger ,curry leaves and cashewnuts.Saute for 30 secs or till aromatic. Add this tempered mixture into the pongal and boil.Note: If rice is not mushy then add 1 cup of water and adjust consistency. 1. Pongal thickens a little on cooling. You can save leftovers in the refrigerator and re heat in a microwave or on stove top (add water if required to adjust consistency) just before serving. 2.You can also use husked split moong dal,makes dish more healthy.